Tiny delicacy or declining and suffering species? French chefs face off against bird conservationists. Banded Stilts seem to have a secret talent for sensing oncoming rains. Bad news at the poo ponds: birds may take a turn for the worse from all that Prozac in our waste. Fledgling seabirds appear to be blinded by the light. “I’ll show you mine if you’ll show me (toxic beetle–deparasited) yours” … ah, young Great Bustards in love. The Cornell Lab’s new bird biology site is more than feather-deep. You can see about 13% of the world’s bird species at the Harvard University Museum of Natural History’s new exhibit. Australian researchers think studying birds may provide the key to helping airplanes avoid turbulence. Stressed young Zebra Finches seem to be less picky about the company they keep. Not cool, British raptor hunters. Not cool. Want to build a better-running robot? Look to flightless birds. From the It Had to Happen Department: There’s now an Angry Birds theme park. “k thx bye” say North American migrants. Not so fast, says climate change. Exactly how many birds has Europe lost in the last 30 years? This many. 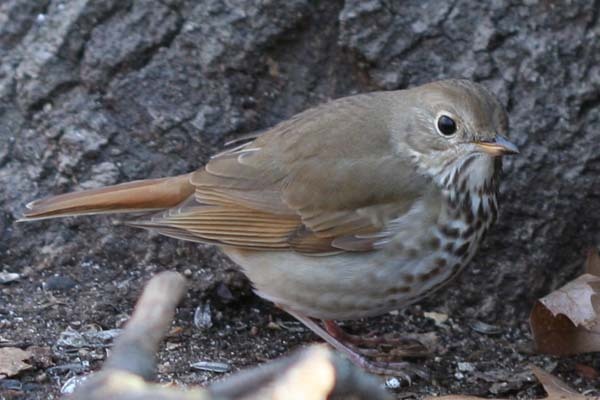 Hermit Thrushes (like the one Corey snapped a few years back in Forest Park) have harmonics and they’re not afraid to use it. Submitted for your adoring: Happy Wheels, also known as Roll of the Penguins. “The Elvis Presley of Central Park”: an update on Pale Male.